Without the proper tools, pizza can be a real chore to prepare--no matter how tasty the final product is. One item that's always necessary is the pizza cutter. 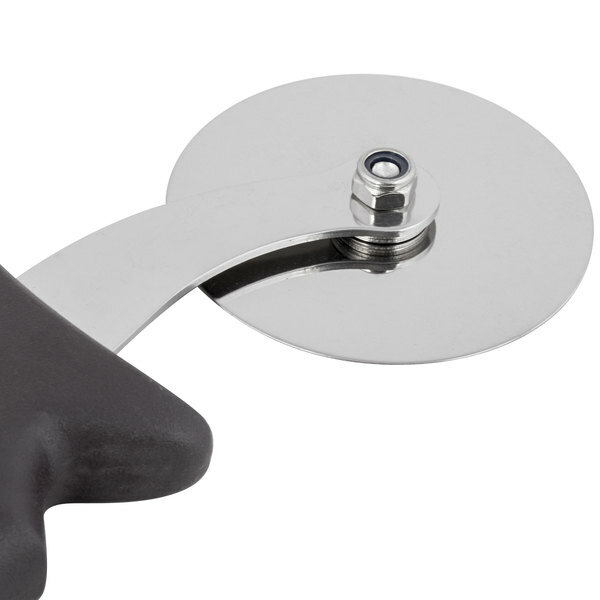 This item boasts a 2 1/2' stainless steel wheel with a durable polypropylene handle. 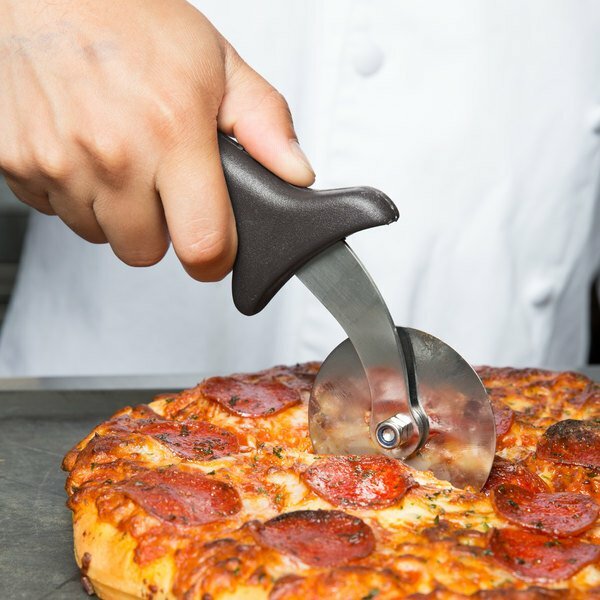 Its ergonomically shaped handle makes cutting through countless pizzas simple and painless. For convenient and out of the way storage, the handle includes a hole for hanging up the tool. This cutter is also capable of much more than just pizza cutting. Whether you are slicing up sheets of brownies, fudge, or quesadillas, this tool is quite capable of tackling all kinds of foods! I use this for cutting fondant instead of pizza, though I'm sure it would work great on pizza too! Rolls so smooth and cuts sharp and clean. So much better than the more expensive cutters I've tried. Plus it comes with a shield which I appreciate. Definitely going to order more! We like the pizza cutter a lot. 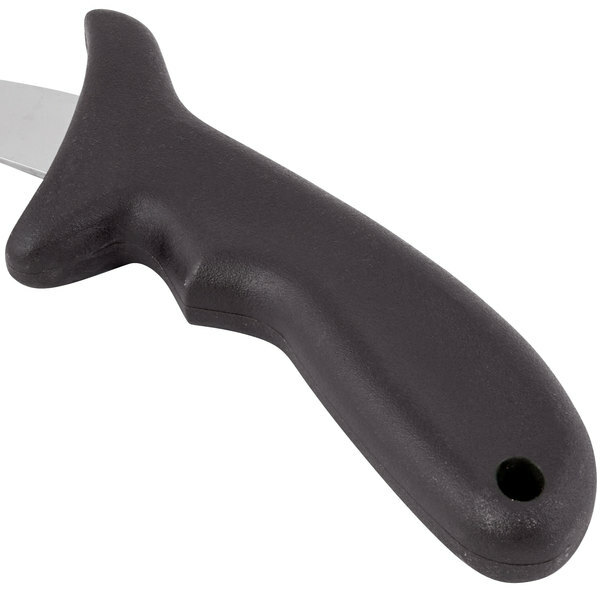 This one cuts pizza with sharpness. And the wood handle grips so much better than a plastic handle would. I use the two and a half inch pizza cutter wood handle for everything from thin crusts to deep dishes. It is a great size for and cuts through the crust with no problems, but I was really impressed at how smooth the cutter felt as it went through the pizza. Works well, great solid construction, not too heavy and easy to order. The 2 1/2" Pizza Cutter with Wood Handle works really well for cutting pizza. The quality is good as the price is reasonable. I recommend this pizza cutter. great pizza cutter that works really well, it cuts through flat breads really quickly, and can be cleaned nice, only problem is the smaller size, but good for home use. The t shape handle design prevents cutting your finger if you lose your grip. It's great for personal kitchen use with cutting pizza slices, cheeses, or puff pastry. The blade is sharp and doesn't wobble. I've used this for pizza and sandwiches and it works very well for both. The wood handle isn't very ergonomical, but it's still pretty comfortable. nifty little pizza cutter for a great price. make sure you dry it out completely after each wash to properly care for it. just the right size for home/personal use. It's always good to have plenty of pizza cutters on hand. Wooden handles are more comfortable and when you order through webstaurant yiu know the wheel will be of great quality and will produce a great cut on your pizza. Used the 2 1/2" Pizza Cutter with Wood Handle to cut sandwich cheese for crackers. The blades cut through the cheese with such ease. Nice for the blade to do all the work and my job is much easier. I love this pizza cutter ! it Glides very nicely I actually use it to cut my fondant. but I will be purchasing want to cut my pizza thanks to webstaurantstore. Inexpensive, well-built and functional. I like the fact that the wheel is made of stainless steel - doesn't get rusty and easy to clean. Good product for the price. Works as expected, the quality seems to be pretty good. It's held up well so far after a couple dozen uses. It cleans pretty easily and I like that it matches nicely with my rolling pin that I also got from webstaurantstore. Excellent value! Excellent little pizza cutter at an unbeatable price. These things are so cheap you could buy them over and over again if you had to...which you won't because they're actually made well! These are worth the pice - we sell them retail for home use so our customers like the simple style and the price, but we don't recommend using them for use in a restaurant. Standard pizza cutter. Smaller size, but it works well. Fits nicely into drawers in the kitchen where space is at a premium. I would recommend it. Not bad at all. This is a small cutter which I found easy to handle. It works fine for me in a light duty environment, and the price is nice. I bought this to use in a future pastry and baking class. I loved the price and the structure and feel that it is very well made. I plan on using it for cutting pasta and pizza. This small pizza cutter is great for small personal pizzas! It is good for home use because of the size! The wooden handle makes it an attractive piece too! It also works great for removing crusts on bread!! Great pizza cutter for the money. Its a little small but it does the job well. Great value and great product for the price. thanks! Great little pizza cutter for the price. It cut right through the homemade pizzas I made. The price is so much better than the cheapest one I could find at a regular store and the quality is so much better. I love the wooden handle. great for cooking i just love these and u can use them for gifts 2 pizza lovers, pasta makers I would buy more of this item.